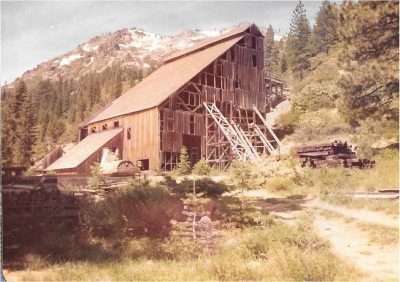 The mill seen in 1976, after it had been stabilized to the degree that the mill could be entered from the top. 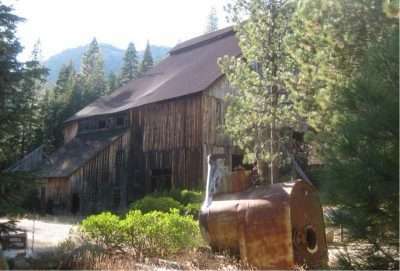 Tim Hardie, president of the Plumas-Eureka State Park Association, has been watching the iconic Mohawk Stamp Mill slowly sink under the weight of time and snow, and is concerned. 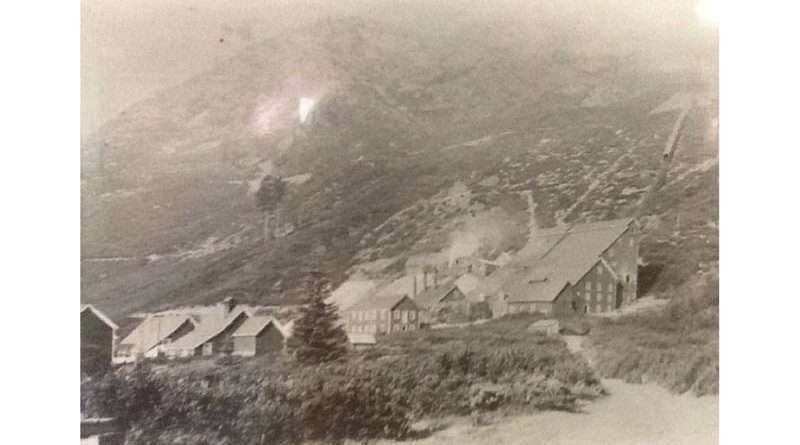 The stamp mill was constructed in 1876 and went out of commission in 1915. 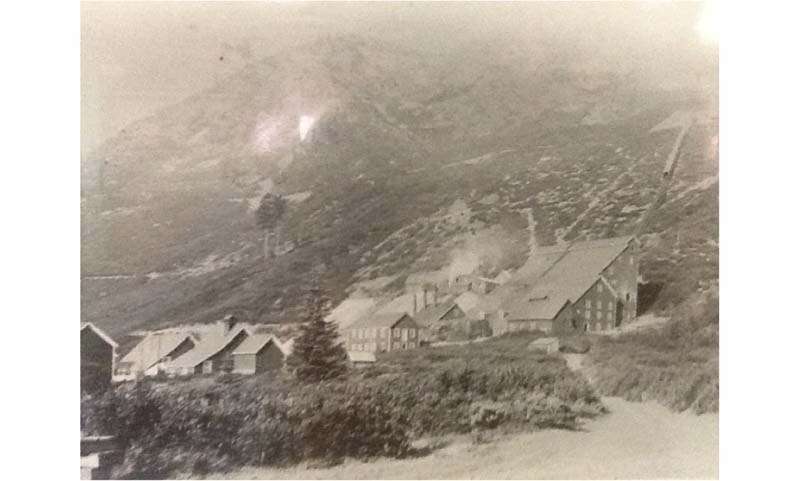 The mill was used to mill ore to recover gold, at a full output of 2.5 tons per 24 hours. The mill was partially restored in 1962 at a cost of about $50,000, according to PESPA. Not long after, in 1976-77, a serious drought and a severe infestation of the ubiquitous bark beetle killed off many Ponderosa pine trees in Burney Falls State Park. Instead of letting the wood go to waste, park employees hired a portable saw mill operator to cut down the trees and saw them into lumber to utilize for restoration purposes, after the lumber was pressure treated in Oroville with a preservative. The historic structure took another hit from nature during the winter of 1991-1992, when heavy snow crushed the lower portions of the mill, which housed concentrators. The mill was partially restored; however, the continuing deterioration forced closure of the mill to visitors completely. As of January 2017, the structure is still standing, but “a lack of funding all around inhibits a permanent restoration to the structure, especially as this project is a very expensive proposition,” according to Hardie. Carl Chavez, prior park manager and founder of PESPA in 1976, voiced concerns that the project will be lost in the mix while the National Park Threats Committee focuses on projects in other areas of California. Chavez’ main concern is that the metal roofing is caving in due to interior support beams collapsing. “You can really see this large bowl in the roof of the old mill, where it is collapsing, and with that bowl, snow isn’t sliding off of the roof — it’s just sitting there and collecting, putting more stress on the building,” said Chavez. The Mohawk Stamp Mill in November 2016 shows a definite indentation of the roofing where interior support beams have collapsed, raising concerns for park staff that the building will deteriorate to the point of no return. Chavez and Hardie both stressed that they are allies with the Department of Parks and Recreation on this project, they just don’t want this project to be delayed to the point of no return. The project will continue to be an ongoing process, and outcomes may depend upon the amount of damage the mill sustains through the remainder of the winter season.